Where to Buy Target 6 Plus, Target 6 Plus Herbicide MSMA - 2.5 Gal - $99.95 for Sale with Fast Free Shipping! 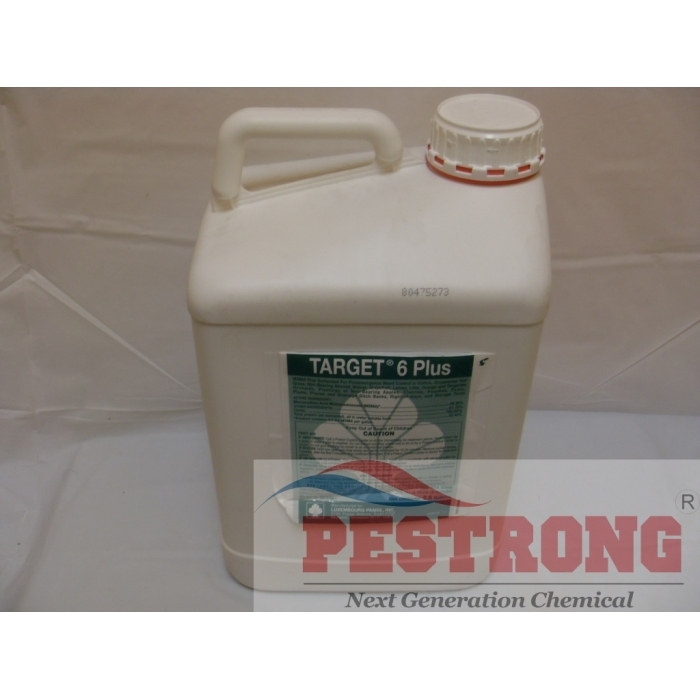 Target 6 Plus Herbicide MSMA - 2.5 Gal used for postemergence weed control in cotton, golf courses, sod farms and highway rights of way. Effective against many hard-to-control weeds and grasses, including some weeds that are glyphosate resistant. Target 6 Plus can be used for selective control of bahiagrass, barnyardgrass, chickweed, smooth and large crabgrass, dallisgrass, nutsedge, sandbur and wood sorrel with little or no injury. DO NOT reseed until 2 weeks after last application. 1 oz per 1 ~ 3 gallons of water / 1,000 sq.ft for most case, but see label for details. MSMA and ragweeds is like showing dracula the Cross. 1/2 oz of MSMA and 3/4 oz 2,4-d per gallon of water and you can spray right on your bermuda grass. after the week later, all of the ragweeds and green bermuda DEAD DEAD DEAD!!! i definetly buy this product again. I put it on my grass and a couple days later all the weeds were dying. It was a gradual process, but it does work on stickers too. Don't need to say much, the rating speaks for itself. exactly what I need, works just like advertised, and very fast shipping! Product works good, value not so good, it is much cheaper on other web sites, but pestrong will NOT match price or give the difference in a refund credit, even though they advertise that they do. I brought it to their attention, first email was ignored, so went through the online help and was told they will not match price (I wanted to re order) and that they would not credit the difference. customer service ???? I use this product all the time, in my opinion, this is definitely the best herbicide out there. The product works beautifully, price is very reasonable, and shipping is lighting fast, I am very very satisfied with the product and the website. This product helps me control even the toughest weeds at a reasonable price, no reason not to give 5 stars! Best Herbicide, this product is no doubt, one of the best herbicide in the world. Excellent product on grassy weeds. It's a very good product for selective broadleaf control. Great Product, especially for large acreage. Excellent Product! Economical for agricultural use. Great product, killed almost all crabgrass 1st application, after 2nd application everything I wanted gone is gone. Most all crabgrass died in first application, 2nd application completely gone. Use it according to label and works great. I use this to get rid of yellow nutsedge works great. Great product and Pestrong is alway easy to deal with. 5 stars all around. I been used this product many times and i really liked it ! Also pestrong have lowest price ! that made me happy ! I have been a Pestrong customer since 2012 and will not shop anywhere else because of their customer service and on time shipping. The MSMA Target 6 Plus is the best post emergent on the market in my opinion. I have used this over 3 years. I need this again. proven result! Kevin helped me order this. Thanks. This is best field management herbicide. Safe under tree drip line, no soil activity, and eliminates the hard to kill weeds. Will buy again. I have used MSMA and got great results within two weeks. In this Arkansas, I have to use MSMA 6 plus. other product is not available. This is good stuff. It did better than I expected. Crabgrass would be dead with this powerful MSMA. I like it. This is my frist order, ordering was fast! Highly recommend! Excellent product on grassy weeds. Weeds were almost dead in 3 days. Did not effect my Bermuda at all. I used 3 TBS per gallon of water. I am going to check and see of I can mix Trimec with it. Pestrong is a great company. My order was at my front door in 2 days. I like MSMA Target 6 plus. I don't need extra money to buy surfactant. great product. thanks for the fast shipping. THANKS! GREAT CUSTOMER SERVICE BY KEVIN LEE!